Marcia Clark just can’t or won’t let it go. The money’s too good. Nearly a quarter-century removed from her less than stellar prosecution of O.J. Simpson at his 1995 murder trial, Clark strikes again with ABC’s seemingly redemptive The Fix, which she both created and executive produces. The names and years have been changed but the basic storyline remains in place while the Marcia Clark cottage industry is at full throttle. FX’s acclaimed 2016 limited series The People v. O.J. Simpson: American Crime Story rehabilitated Clark to a large extent, with Sarah Paulson winning an Emmy for her portrayal and Clark beaming as her special guest at the awards ceremony. While Simpson roams free anew, Clark also has written numerous legal novels, appeared as a cable news network analyst and hosted Marcia Clark Investigates the First 48 for A&E. But at age 65, she’s still clearly haunted by the one that got away. That’s where The Fix comes in. Clark has described it as a “soapy, serialized roller coaster of a show” while also contending that its lead character is not a mockup of her. Objection, your honor. Objection sustained. 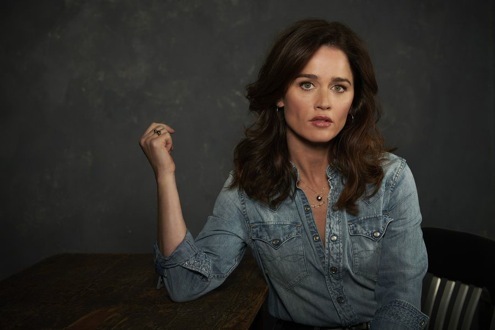 Robin Tunney stars as prosecutor Maya Travis, who’s first seen in the final stage of a 2010 Los Angeles murder trial in which “mega-movie star” Severen “Sevvy” Johnson is accused of stabbing and killing his wife and her best friend. When he’s shockingly found not guilty, head prosecutor Maya flees L.A. and in present-day has settled into the arms of a Monroe, WA rancher named River “Riv” Allgood (Marc Blucas). The real-life Clark no doubt sees it this way, too, although an ample number of critics, including Vincent Bugliosi and Jeffrey Toobin, have found her prosecutorial skills severely at fault in the Simpson case. There’s a problem here for ABC, and it has little to do with the self-serving nature of the series. Judged by his actions in the early going, Revvy indeed does seem guilty. But if The Fix ends up judging him so, does the network by implication convict Simpson as well? And if he again gets off, is ABC in effect exonerating Simpson? Because make no mistake, viewers are going to see this as O.J./Clark: Round Two -- and in fact are encouraged to do so. Not that Clark hasn’t been very well-compensated since, beginning with a reported $4.2 million book deal to tell her story in 1997’s Without A Doubt. The Fix, which basically tells her story again under the guise of fiction, also includes Breckin Meyer as self-aggrandizing district attorney Alan Wiest (squint and you might see the real-life Gil Garcetti) and Mouzam Makkar as a jealous prosecutor who consorts with the enemy. The evil Wolf also has an amoral young “media guru” who’s firm in his belief that anything can be staged for the benefit of an easily duped, social media- addicted public. Still, Episode 2’s choreographed brunch with Sevvy and family members is a big stretch even in that context. It’s tempting to say that The Fix can be goofed on and lapped up in the way ABC’s Scandal was for too many seasons. To its credit, it at least lurches forward rather than plodding along, with Maya at one point in tears about wanting to “see Sevvy Johnson rot” before events briefly break in his favor. Whatever the outcome, though, The Fix hits too close to the bone. Whatever Marcia Clark’s disclaimers, this is all about her and a case that remains dirty to the touch. Retrying Orenthal James “O.J.” Simpson in the form of Severen “Sevvy” Johnson does not serve anyone well, particularly a complicit ABC. But it’s a done deal, and everyone has already been paid their blood money.